• Longmen Taiji Quan was originated from Taoism and for hundreds of years not imparted to outsiders. It was passed on generation by generation to selected indoor disciples by word-of-mouth only and was rarely known to others. 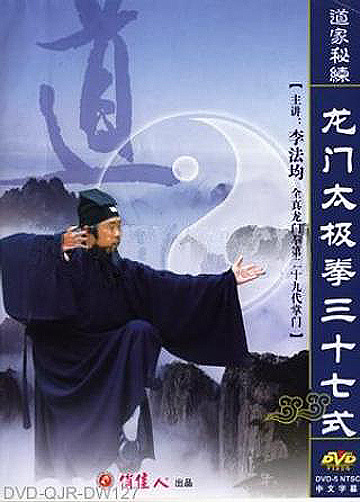 Longmen Taiji Quan integrates with Taoism medicine, Nei Dan (internal alchemy), regimen and taoist martial arts as a whole, has its unique effects in disease prevention and cure as well as a good body exercise. This Taiji Quan will help you to cultivate the Qi to flow through the body channels, promote the ascending and descending, open and close of the qi and blood flow fluently throughout the limbs and body, so as to enhance your immunity and to recover from the disorder of internal organs. As far as disease prevention and cure is concern, it is almost suitable for all human rehabilitation of chronic diseases, especially of good efficacy for neurasthenia, neuralgia, hypertension, high blood pressure, heart disease, nephropathy, tire and trauma of waist and muscle, rheumatism and boneache, arthritis, diabetes, etc. This product was added to our catalog on Monday, November 19, 2012.